Take steps to help Mistress Dratha beat death. Mistress Dratha, having woken from a crippling illness, made it clear that she wants to beat death. 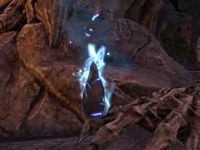 Seven Daedric relics called the Stones of Cold Fire may be the key to achieving immortality. Retrieve the Stones of Cold Fire. Retrieve Xykenaz from his prison. According to Mistress Dratha, the Stones of Cold Fire are hidden away in seven Daedric shrines: Ashalmawia, Bal Ur, Esutanamus, Kushtashpi, Ramimilk, Yansirramus, and Tusenend. I must seek out these shrines and claim one stone from each. I retrieved all seven Stones of Cold Fire. Now I must deliver them to Mistress Dratha in Tel Mora. In order to use the Stones of Cold Fire, Mistress Dratha needs me to weaken a Dremora hidden away in the realm of Oblivion. I should go through the portal to find this Daedra. I defeated Xykenaz. I should enter Mistress Dratha's portal and return to Nirn. I returned safely to Tel Mora. I should talk to Mistress Dratha. Finishes quest I completed all of Mistress Dratha's tasks. I should talk to her to receive my reward. This page was last modified on 17 February 2019, at 20:45.